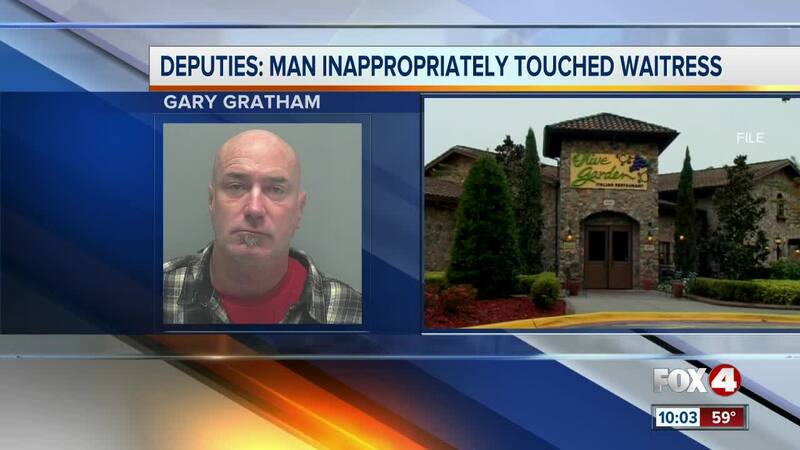 Gary Gratham is accused of inappropriately touching a waitress at a Fort Myers Olive Garden restaurant. LEE COUNTY, Fla. -- A Fort Myers man is accused of touching a waitress inappropriately. Deputies say 49-year-old Gary Gratham was at the Olive Garden on Cleveland Avenue in Fort Myers on Friday evening when he came up behind the woman and touched her private area over her pants and grabbed her breasts. Gratham was escorted out of the restaurant. The server was able to take a photo of him on the way out. The waitress says she saw a news story about a man who assaulted a woman at the nearby Carrabba’s restaurant who fit Gratham's description. Deputies have not confirmed if the cases are connected. Gratham remains in custody in the Lee County Jail on $34,000 bond. He is charged with two counts of Battery, Resisting Officer, and False ID Given to Law Enforcement.